Have You Been Prescribed Januvia, Janumet, Juvisync, Byetta, or Bydureon? There are two commonly prescribed types of medication used to treat type 2 diabetes. Both types of these medications are designed to control the body’s blood sugar and both types have been linked to increased incidence of pancreatic cancer. The first are DPP-4 Inhibitors, known generically as Sitagliptins. Preferred brand names of this type of medication include Januvia, Janumet, and Juvisync. DPP-4 refers to a specific glucose producing enzyme in the blood. By inhibiting the production of this enzyme, these drugs are able to reduce the level of glucagon in the blood (i.e. controls ones blood sugar). The second type of medication commonly used to treat type 2 diabetes is called an incretin mimetic. Some of the preferred brand names of these drugs include Byetta or Bydureon and are all generically known as Exenatides. These drugs work by mimicking the hormone incretin (GPL-1), responsible for regulating the body’s blood sugar levels. The human body naturally produces its own incretin but not always enough. And in the case of Byetta or Bydureon, they mimic the behavior of natural incretin but with longer lasting effects. Both types of these type 2 diabetes medications (DPP-4 Inhibitors and Incretin Mimetics) have been linked to increased incidence of pancreatic cancer. The incretin mimetic Bydureon has been linked to increased incidence of both pancreatic cancer and thyroid cancer. In a recent NY Times article, Dr. Peter Butler gave a compelling interview speaking out against type 2 diabetes medication, specifically Januvia. Dr. Butler heads endocrinology at UCLA and was also a former editor of Diabetes, the American Diabetes Association journal. He found that by artificially increasing the hormone incretin (GPL-1), this may accelerate precancerous conditions already present in middle-aged people. The diabetic drug litigation team at Walton Telken believe that the manufacturers of these type 2 diabetes drugs may have acted negligently in both the testing of their drugs and in improperly warning patients of the dangerous side effects of taking their drugs. Were you prescribed Januvia, Janumet, Juvisync, or Byetta and subsequently diagnosed with pancreatic cancer? Were you prescribed Bydureon and subsequently diagnosed with thyroid cancer or pancreatic cancer? Financial compensation may be available to the victims or their loved ones if we can prove that the manufacturers of these drugs were in fact negligent in either the testing of their diabetes medication, or in their inadequate warnings of the dangerous side effects. Walton Telken are currently offering free consultations for all of our prospective Januvia, Janumet, Juvisync, Byetta, and Bydureon clients. We will let you know your options. If retained to represent you, we will assume all upfront financial risk – this means we cover all the expense of litigation and only charge a fee if we win your case. We will work hard to obtain fair and adequate compensation for the victims of these drugs, and/or their families. Finally, our team of attorneys have been successful in this and various other types of litigation. 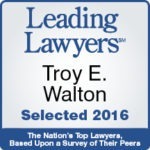 Walton Telken attorney Troy Walton is a member of the Million Dollar Advocates Forum – this is a prestigious and exclusive group made up of than 1% of U.S. lawyers who have won million and/or multi-million dollar verdicts and settlements. If you believe that type 2 diabetes medication may have caused you or your loved ones thyroid or pancreatic cancer, call us today (1-844-307-7349) for a free, no-risk consultation.